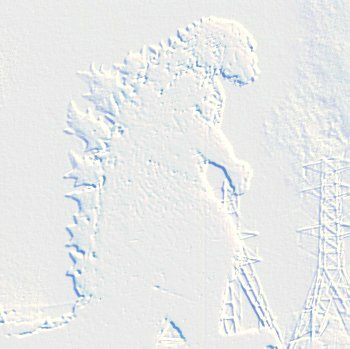 A compilation album dedicated to the "Godzilla" series will be released on December 3rd in conjunction with the theatrical release of "Godzilla Final Wars." Including SUM41, ZEBRAHEAD, 10-FEET, and more, various big artists took part in. Remixes and covers of "Godzilla Theme" (music by Akira Ifukube) included. This various-artists CD serves as both a commemoration of Godzilla's 50th Anniversary and a tie-in with the release of GODZILLA: FINAL WARS, reportedly Toho Studios' last film in the series for the foreseeable future. 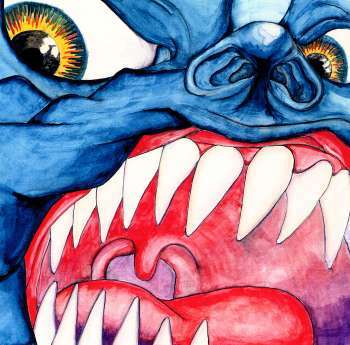 Fans of '70s progressive rock will be immediately struck by the CD's cover art, an obvious homage to the cover of King Crimson's legendary 1969 debut album, In the Court of the Crimson King. Unfortunately, the music on G.Lasts is far less ambitious - a disappointingly uneven collection of contemporary pop tributes to the Big G.
Sum 41 get things off to a questionable start with a song from their most recent album, Chuck. "We're All To Blame" is a predictably formulaic slice of silly punk-metal posturing with a grafted-on melodic chorus. The lyrics are a preachy, pretentious mess, and worst of all, they have nothing whatsoever to do with Godzilla. I don't know if we're ALL to blame, but Metallica, Green Day and the Smashing Pumpkins certainly have a lot to answer for. Felix da Housecat's instrumental "Rudezilla Mix" attempts to blend techno dance beats, monster sound effects and a mutated sample of Akira Ifukube's "Godzilla Theme", but the results are about as digestible as a porcupine smoothie. The track is jarring and disorienting, with no identifiable hook , and the sound effects appear to be inserted at random. The only hint of melody comes from the disembodied "Godzilla Theme", which in this context is simply lost at sea. Zebrahead, on the other hand, contribute a much more coherent version of the famous theme in "Godzilla Vs. Tokyo", a galloping guitar-rock workout with multiple G-roars and samples of frenetic Japanese dialogue. Not bad, but Godzilla's roar is repeated so many times it becomes distracting. The next two tracks offer a more interesting take on the "Godzilla Theme". The first, by UK-based electro-lounge group Stereolab, also piles on the sound effects, but they are less familiar ones (such as Minya and Spiega) that are better integrated into the rhythm of the song. Nevertheless, the effects still overpower the music, and the velvety-smooth vocals of Laetitia Sadier are sadly absent. Far better is the jazzy, vibraphone-laced version of the theme by Japanese artists Low IQ 01. The clever arrangement, shifting tempo and skewed rhythm make it one of the best tracks on the album. "Be Nothing", by Japanese group 10-Feet, is a driving punk-metal ditty with growling vocals and a nerdy They Might Be Giants-style chorus. Unfortunately, the lyrics have "Nothing" to do with Godzilla. In contrast, Bank$'s appealingly rhythmic "Godzilla is Coming to Town" is far more topical. The song opens with a sample of the "Ritual on Odo Island" theme and quickly breaks into a funky, danceable groove, complete with fun, rapid-fire vocals, catchy electronics and sampled dialogue - not to mention a verse of "Mothra's Song", and even a guitar reference to the Beatles' "Taxman"! "What's Wrong?" by Mold Bond Akiko is another rhythmic slice of J-Pop. With its syncopated beat, sputtering electronic arrangement and lyrics that arguably tap into the source of Godzilla's frustrations, how can it miss? Tatsuo Sunaga's sultry jazz number, "Godzilla: European Bliss" is another track that plays it coy with Godzilla references. A mellow confection of tasteful piano, muted horns, shuffling percussion and acoustic bass, it artfully integrates samples of the flying saucer sounds from MONSTER ZERO. Ifukube's "Godzilla Theme" is only briefly hinted at, and a couple of sampled roars are slipped in at the very end of the track. Hoobastank inexplicably contribute an acoustic version of their whiny hit ballad, "Reason" - fans of the group will be pleased, but why it's included on this CD is anybody's guess. The Chemical Brothers fare better with their darkly percolating techno number, "Rize Up", but here again the song's Godzilla-related credentials are in question. The final track is by keyboard wizard Keith Emerson, best known as the driving force behind the '70s prog-rock trio, Emerson, Lake and Palmer (coincidentally, vocalist Greg Lake left the original lineup of King Crimson to join ELP). In recent years, Emerson has been more involved in scoring films, and is one of three primary composers credited in GODZILLA: FINAL WARS. The track included here is not nearly as arresting or original as Emerson's work with ELP - in fact, it sounds more like music from an action film or anime feature than a Godzilla flick. Then again, FINAL WARS isn't exactly a typical G-film. While G.Lasts has some genuinely interesting moments, it doesn't quite live up to its potential as a fitting 50th Anniversary tribute. A better approach might have been to assign each artist a different Godzilla theme (there are lots of them, guys), instead of playing the same one to death - or ignoring Godzilla altogether! The now-deleted 1991 CD, A Tribute To Godzilla (VICL-8030) is a far more creative and satisfying effort if you can find it.